I'm both a bit surprised and relieved that it's the last day of February! That means I survived what I often think of as one of the longest months of the year. I hope it means spring will be on it's way soon. The Encouraging Hearts & Home Bloggers Join your Encouraging Hearts & Home Co-Hosts each week for encouragement and support for your heart & your home. We hope to provide a space that builds each other up and lends a helping hand along the way. With all the negativity in the world, let's shine a positive light! ***Each week, our co-hosts will each choose our favorite links, along with the most clicked link, and pin them to our Encouraging Hearts & Home Pinterest board. The most clicked post from last week's Blog Hop:Was my very own post! Which Has More Water; Ice or Snow? It's just about the end of the month and time for another What's Up Wednesday post. Today I am linking up with Mel and Shafer and all their blogging friends to talk about What's Up. I can't believe it's the end of yet another month! Looking back we had a great month. We toured three museums, worked on two new science experiments, took a painting class together and tried out a few new recipes. We even made it out hiking a time or two. Monday: Baked shells and sauce with homemade garlic bread. What I'm Reminiscing About: Warm weather fun! We've had a few teasers of spring weather this past month and then a few more snow and rain storms. Those days of warm sunny weather remind me of all the fun we have in spring and summer! Alec picked out so many books for his birthday last month and has spent lots of time reading through them all this month. 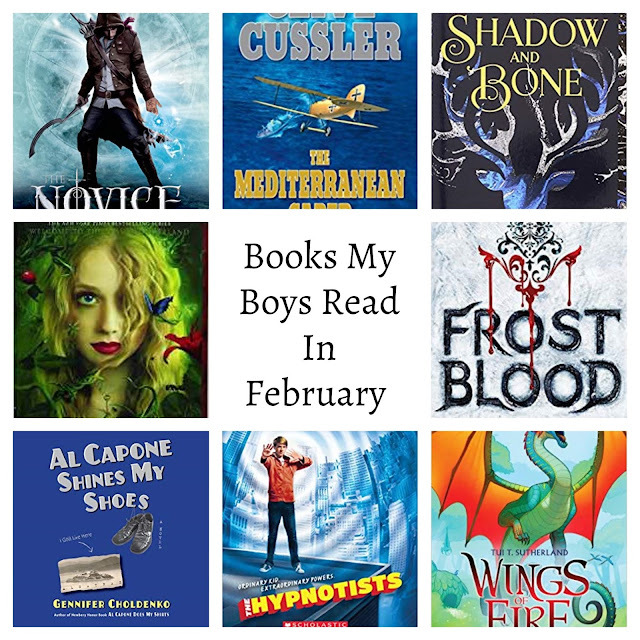 The other two boys have been steadily working their way through their book series as well and we found a few books to read together too. 1. Summoner book 1; The Novice-- Fletcher is a blacksmith apprentice and he finds out he can summon demons from other words. He heads off with his demon to an academy where he will learn more about the art of summoning. 2. Splintered-- Alec fully admitted that this was not his favorite book. He picked it out as one of his birthday gifts but was disappointed that it was a weird parody on Alice in Wonderland with a headless Chesire Cat and other odd characters. I don't even think he's finished reading it. He set it aside and read some others he liked much better. 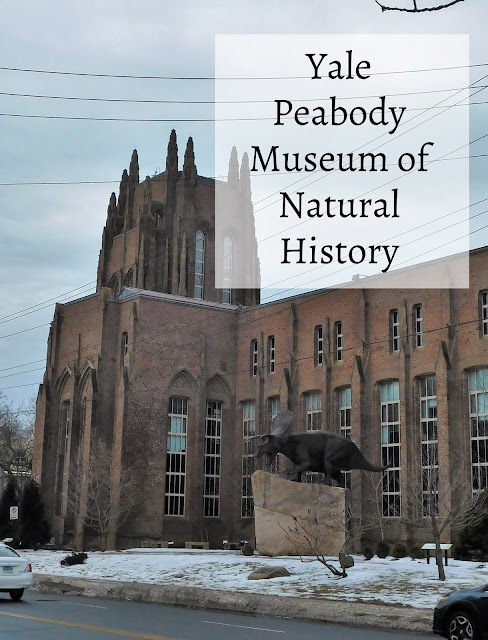 We bought a family pass to the Yale Peabody museum in the fall and had yet to use it! The boys and I made plans to meet up with some of our friends and check out this "new to us" museum one Friday this month. We had such a great time! 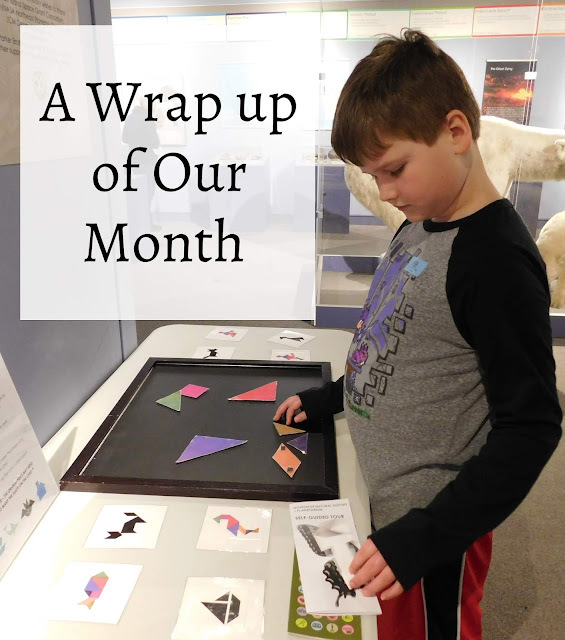 We spent over 2 hours exploring the museum and learned a lot about dinosaurs, fossils, leaf cutter ants, outer space, rocks and minerals, and so much more. We started our trip with this fun display on preserving arthropods. Next we went to check out the small exhibit on California gold; we were really drawn to the map that showed all the old gold mines versus those that are still active today. Alec and Evan spent a lot of time reading about and learning about dinosaurs. The museum had one of the largest collections we've ever seen! Having just read and learned about petrified wood during our Boston Museum of Science trip earlier this month, the boys and I were all in awe of these specimens.